How to Relax and Recharj with Adult Power Naps in the Heart of D.C. Immediately after last week’s meditation-focused Delucchi U, I had a moment of fortuitous coincidence. Out of the corner of my eye on my walk home, I saw a sign that read, “Power naps now #meditateDC.” Out of sheer curiosity, I decided to take a photo of the sign and follow up to see what the place was all about because, naps? For adults? Why not. After some research, I learned that the sign was advertising a new mindfulness studio called Recharj, where one can stop by for quick or guided meditations, and even power naps. I continued to pursue my curiosity and decided to sign up for one of Recharj’s 20-minute power naps. Having no idea what I was in for, I was shocked to arrive at a studio that was set up for optimal comfort. There was free tea, ambient lighting, comforting smells and soothing music set up to quiet any of the outside stressors and noises of the busy city. Christine Marcella, the studio manager, walked me through the studio and showed me where my nap would be. I was walked over to a “napping cocoon” complete with a blanket and lavender-scented eye pillow. I then sunk into my pod and drifted into the best power nap I’ve ever taken. 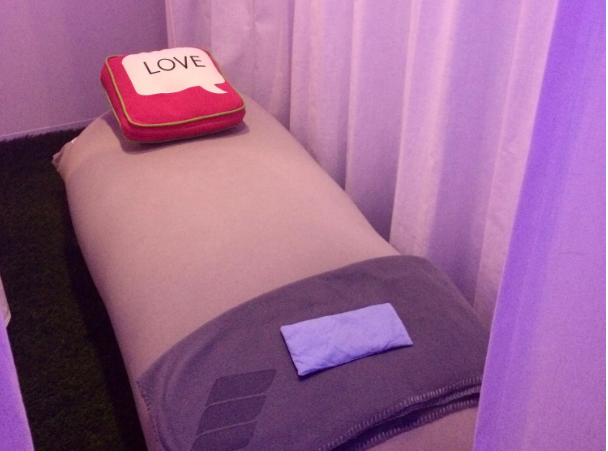 Recharj’s goal is to create a sanctuary for D.C.’s residents to come by and calm their mind and body. The studio is located perfectly by the White House where upon stepping outside, you’ll hear cacophonous city sounds and be surrounded by large crowds. It makes sense that when I walked by the sign, I immediately noticed it and was drawn to walk in. The studio’s social media presence also plays a big role in representing its core values through inspirational quotes and lifestyle photos that evoke Recharj’s mantra. In a transient and busy city like D.C., Recharj provides the perfect afternoon rejuvenation, or really the opportunity to relax at any given moment.